Energy Australia’s OCGT’s at Hallett: being paid to burn gas for nothing. South Australians wake up to a nightmare every day. Its hapless Labor government’s obsession with wind power has destroyed the reliability of its electricity grid and sent power prices through the roof. Here’s why. The Australian Energy Market Operator (AEMO) was forced to intervene in South Australia’s electricity market on Anzac Day to guarantee security of the grid as the state recorded record levels of wind energy production. Wind power peaked at a new high of 1,540 megawatts close to midnight on Tuesday, more than meeting the state’s public holiday electricity demand. 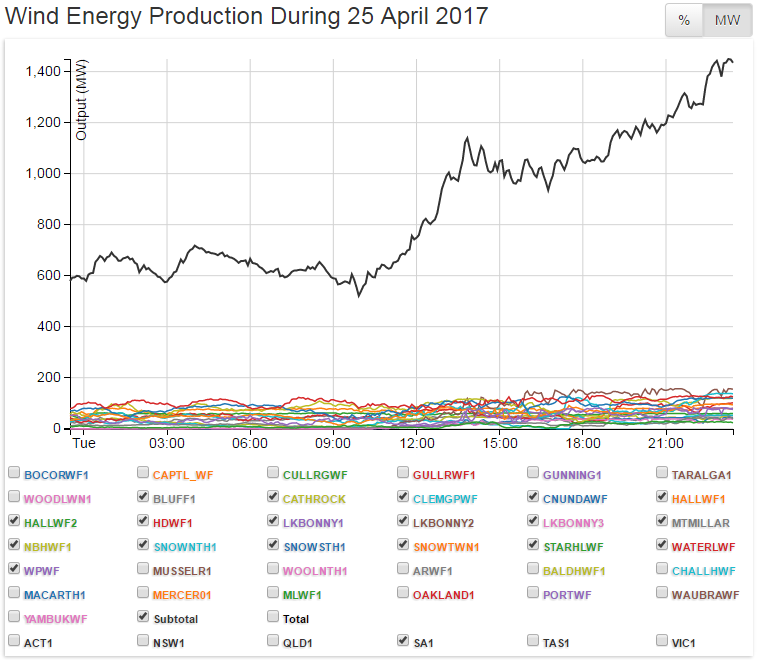 The wind production was so high that earlier in the day AEMO took steps to ensure two gas generators remained on. “A combination of high wind generation and low demand had resulted in the de-commitment of synchronous plants below the required levels,” an AEMO spokeswoman said. AEMO would not confirm which gas generators were subject to AEMO’s directions, but the ABC understands they were AGL’s Hallett Power Station and one unit at Torrens Island. A requirement for two large synchronous power stations to remain online at all times was put in place in the aftermath of the September 28 statewide blackout. 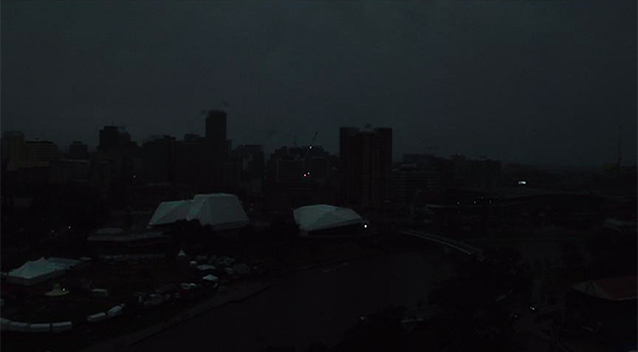 In that instance, when South Australia unexpectedly separated from the rest of the National Electricity Market, there were too few synchronous generators operating to keep the grid frequency in balance, forcing lights out across the state. Synchronous generation is typically provided by gas, coal and hydro power plants. None of the wind farms currently operating in South Australia provide synchronous characteristics. AEMO’s decision to order on two gas generators means their owners will be compensated under special rules, as opposed to taking the prevailing wholesale price for the electricity produced. The direction for one of the generators remained in place until midday today. The decision meant AEMO was also forced to constrain the output of two other generators to keep supply and demand in balance. The market operator would not reveal whether those constrained generators were wind farms. 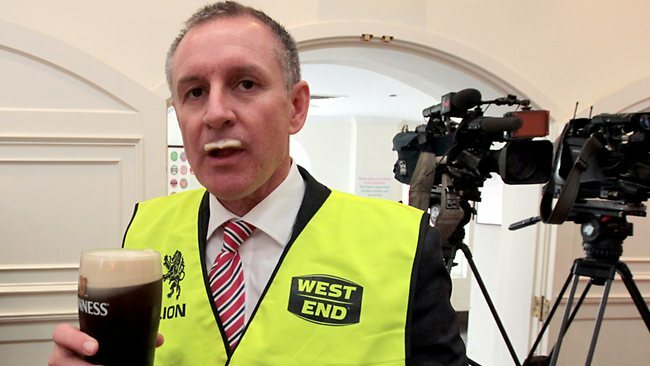 Jay Weatherill: would have been a master behind the Iron Curtain. One could be forgiven for thinking of South Australia as the kind of place that sat on the wrong side of the Iron Curtain, before East Germans took to the Berlin Wall with sledgehammers. Taken at face value, that statement would suggest to the uninitiated that sometime very soon South Australia will be able to build a wind farm which has “synchronous characteristics”; or that somewhere else outside of the embattled little State wind farms do “provide synchronous characteristics”. One can’t expect too much from our ABC. So STT will fill in the gaps. In electricity generation “synchronous” means immediately matching supply (ie generation output) to demand (ie the load) and doing so on a second by second basis, which means increasing and decreasing output as the load dictates – not the Wind Gods. In the absence of an enormous wind making machine, no wind turbine anywhere in the world provides “synchronous characteristics” (see our post here). As any sailor or kite flyer knows, the wind varies moment by moment, place by place: to suggest that something as fickle as the wind can provide power as and when it is needed, either in terms of voltage and frequency, is patent nonsense. Not quite the 1,540 MW claimed by the ABC (the total capacity of SA’s wind farms is 1576 MW), but at over 1,400 MW, pretty close to a record. The peak on the far right takes in Tuesday, 25 and Wednesday, 26 April. That precipitous and almost total collapse (more than 1,300 MW) in the space of a few hours is enough to completely kill a power grid. In South Australia it’s happened plenty of times before (see our posts here and here and here) and, once bitten and twice shy, it’s pretty clear that Jay Weatherill & Co are ready to do whatever it takes (irrespective of the cost) to ensure it doesn’t happen again. No one expects the AEMO or Jay Weatherill to reveal just how much it’s costing South Australia’s power consumers to have a squad of peaking power plants running in the background (burning gas or diesel) simply to throw power into the grid as wind power output collapses, in order to prevent more mass load-shedding or total blackouts. But gas is now far from cheap in Australia (as industrial gas users are painfully aware) and the owners of Open Cycle Gas Turbine peaking-power plants are happy to demand their pound of flesh, gouging anything from $2,000 per MWh right up to the market cap of $14,000 per MWh, for power that conventional base-load plants can deliver for less than $50. What AEMO and Jay Weatherill will not be able to conceal is what confronts South Australian power consumers when they open power bills that are almost double those prevailing in neighbouring Victoria and which can only get worse. South Australians paying dearly to prevent another ‘system black’. I didnt realise that the synchronous reference was just load level matching. I thought it was phase matching the various supplies. It is pretty hard to ‘match various supplies’ when one particular source disappears altogether when winds slacken or blow faster than 25m/s leading to an automatic shutdown – occurrences that occur with little warning and the other source in the subsidised renewable stable disappears at sunset every day and all day when it’s cloudy. Trying to ‘rely’ on sunshine and breezes means that the margins for error are huge and SA has shown itself capable of getting it wrong time and time again. Collectively Yarpos it’s a matter of maintaining phase, voltage and current (load) all within stable operating limits. If these parameters aren’t kept within this range then the grid becomes unstable i.e. it is likely “tear” itself apart with large generators pole-slipping (going out of phase with one another) resulting total grid collapse with likely major generator damage. Such a catastrophe on the Australian eastern grid could mean total loss of electricity to Australia’s entire eastern seaboard for up to a week. While Jay Weatherill and his merry yes-men might claim otherwise, it was to precisely to prevent such a catastrophe that the soundly designed electrical protection on the VIC – SA interconnector “cut the chord” when the SA windmill, hippy grid went AWOL on 29 September 2016. The late AEMO chief Matt Zema well understood the implications of the increasing penetration of low inertia generation (wind and solar) but the new Turnbull/Frydenberg appointees at AEMO maybe not, or if they do they’re not likely to be admitting it. Thanks, nice to get an informative, snark free response. The maximum power outputs from the ABC and Aneroid are both correct. Aneroid’s 1450 MW (approx) is the actual power produced whilst the ABC’s 1540 MW is the amount used by the wind farm operators to calculate LGC entitlements. The problem of synchronisation is real and will continue to be a problem in SA until sense returns to the need for reliable and cost effective energy. While high winds, and we have had a few over the past month, are a problem, so to are the day after day when the wind is all but absent. This month – May – has been such a period where there has been not enough wind to flutter a flag. 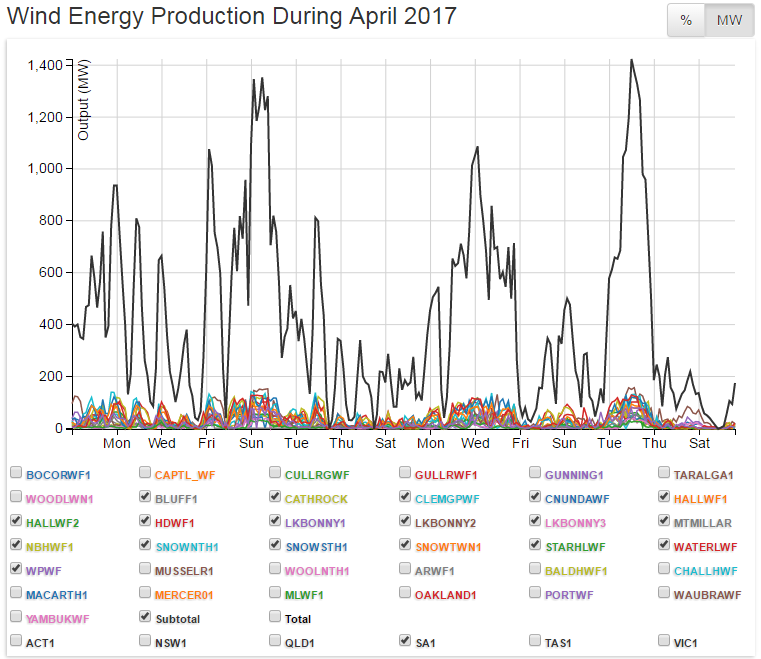 SA has had times when there has been no wind energy being produced and when it has it’s next to nothing – 5 and 12MW at times. 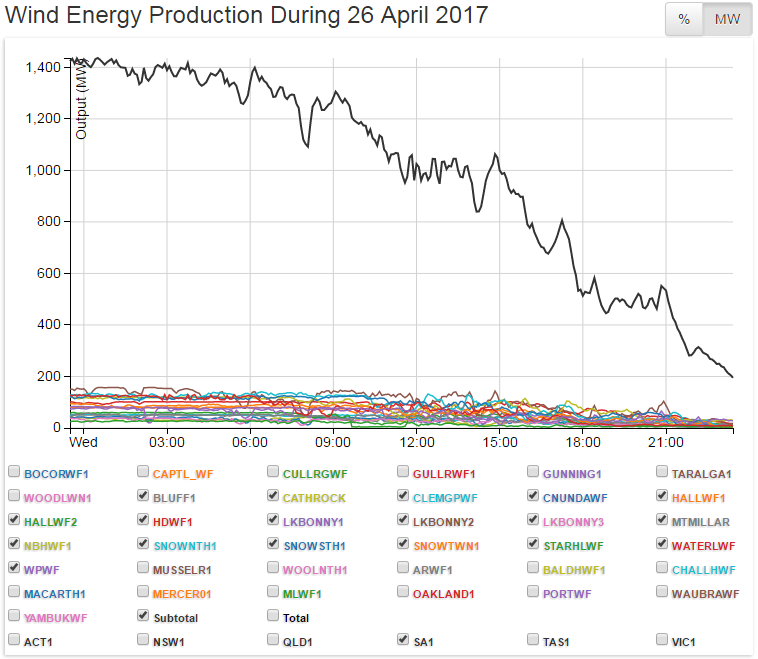 The problem for energy across the grid was compounded by the other States in the Grid also having very little wind, Victoria recorded at one point -1MW, 7MW and 12MW. NSW has been so short of wind energy for days on end they were lucky to record anything. I keep intermittent records of recordings of each Wind site from Aneroid Energy’s website. I have been doing this for sometime and it amazes me how this industry can keep saying it can provide electricity for thousands of homes from each site – well maybe they can if it is assessed as a sporadic provision over a 12 month or more period, but to ensure those homes have energy when needed we need to keep more secure sources of energy production operating, and because now we need to cater for the Wind factor in our generation we have to pay a high price to waste energy to ensure synchronises – where is the logic, where is the security because as SA found out an error of judgement and slow responses landed us all in the dark because of the inability of turbines to operate at all times no matter the weather. The constant need to be on guard and move energy around the grid is costly and wasteful of time and energy and its time the Government called a halt to the expansion of the cause of the problem – Wind Energy. They need to begin a program of encouraging more secure reliable and economically efficient energy generation, and the cessation of the LRET and REC’s, and not allowing any further installations of this form of madness that has created mayhem wherever it has been installed around the world. The cost in human health, lively hoods, in environmental damage and the need to reduce the energy and economic disaster has been going on for far too long, it’s time it ended and Australia and other countries returned to looking after the earth and their citizens in a manner that ensures a healthy and reliable future for all. Australia could be among the leaders, but our Governments are too slow to react to anything let alone to something so damaging as this. International ‘commitments’ should not endanger the lives and lively hoods, or environment of Australia and once such are recognised to be causing damage the only thing a Government dedicated to looking after Australia’s interests SHOULD DO is pull back and cancel the ‘commitment’. Do we have a Government capable of putting Australia and Australians first – time will tell, but do we have the time to wait!!!!! The AEMO’s “DISPATCH OVERVIEW” window on its Data Dashboard continually shows the massive exchanges of electricity between the eastern states. Although the enormous losses involved in making each of these individual exchanges is not defined, they are necessitated by SA’s constantly varying wind generated output being forced into a grid that doesn’t need it but is obliged to take it. The inefficiency of Jay Weatherill’s dictatorial form of idealism is having a costly impact on all electricity users and destroys the real benefits of having the world’s biggest electricity grid. That page does make for interesting viewing at times. It is not unusual to see interconnectors maxed out, with the dependence of SA on a working interconnector frequently on display. The other thing that surprised me is NSW’s apparent reliance on neighbours particularly QLD which seems a regular exporter. Cheap, reliable “Fossil-fuels” to the rescue! NB, Wind power does not work when the wind is too strong or, of course, when there is none. Therefore, the more windmills that are built, the more fossil-fuel backup facilities need to be built too. Net gain – more CO2 emissions! What a joke. The graphs of power output you show are over relatively long periods, when compared with how the wind blows, i.e. they are an average. AMEO uses 5 minute averages and nobody else shows the wind and power output that would place a problem with synchronisation in a different context. However, If you go to the Cooper Cape Bridgewater report (Appendices part 5) Appendix Q, the second and third page show the variation in 1 minute increments for Turbine CBW13. The graphs show the variation in the wind speed, the rotor speed, the power output and the wind direction over 1 1/2 hours. In the same pdf Appendix R page 2 shows the 1 minute results for turbine CBW14. The graphs cover the wind speed, the wind direction, the power output, he blade angle and the rotor speed. In this case it would appear the turbine was in an operating mode to try and keep a constant rotor speed but the power output goes up and down like a yo-yo. These are results for an individual turbine (two turbines but different days). In the main body of Cooper’s report (pages 80 – 86) he provides the turbine output, wind speed and wind direction for combinations of three turbines in 15 minute increments that reveal the variations over a four hour period. No wonder there are problems with syncronisation. Noise: my house is a nightmare – Maitland Private Hospital is a torture chamber of ILFN and EMF. No wind farm – coal mine at South Maitland delivers HELL.